Facets are a great search feature that let users easily navigate to the documents they are looking for. Solr makes it really easy to use them though when naively querying for facet values you might see some unexpected behaviour. Read on to learn the basics of what is happening when you are passing in filter queries for faceting. Also, I'll show how you can leverage local params to choose a different query parser when selecting facet values. Facets are a way to display categories next to a users search results, often with a count of how many results are in this category. The user can then select one of those facet values to retrieve only those results that are assigned to this category. This way he doesn't have to know what category he is looking for when entering the search term as all the available categories are delivered with the search results. This approach is really popular on sites like Amazon and eBay and is a great way to guide the user. Solr brought faceting to the Lucene world and arguably the feature was an important driving factor for its success (Lucene 3.4 introduced faceting as well). Facets can be build from terms in the index, custom queries and ranges though in this post we will only look at field facets. There are three fields, the id, a title that we'd probably like to search on and an author. The author is defined as a string field which means no analyzing at all. The faceting mechanism uses the term value and not a stored value so we want to make sure that the original value is preserved. I explicitly don't store the author information to make it clear that we are working with the indexed value. Let's index some book data with curl (see this GitHub repo for the complete example including some unit tests that execute the same functionality using Java). I'll omit parts of the response in the following examples. 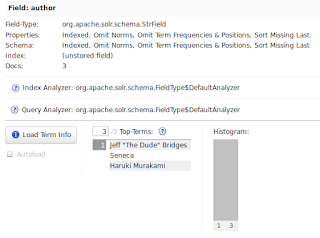 We can also have a look at the shiny new administration view of Solr 4 to see all terms that are indexed for the field author. Each of the author names is indexed as one term. 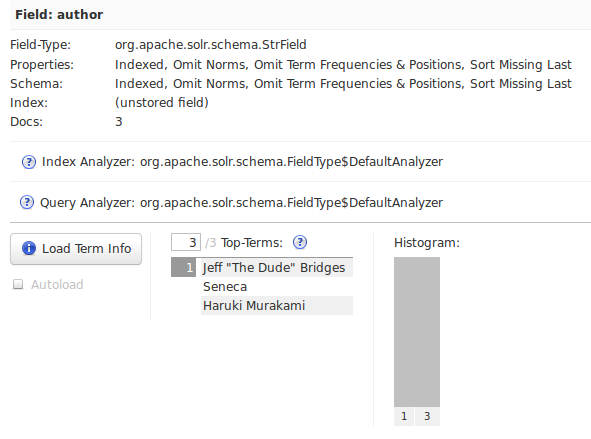 This way we don't have to pass the parameters with the query anymore and can see which parts of the query change. No results. Why is that? The default query parser for filter queries is the Lucene query parser. It tokenizes the query on whitespace, so even if we store the field unanalyzed it's not the query we are probably expecting to use. The query that is the result of the parsing process is not a term query as in our first example. It's a boolean query that consists of two term queries author:Haruki text:murakami. If you are familiar with the Lucene query syntax this won't be a surprise to you. If you prefix a term with a field name and a colon it will search on this field, otherwise it will search on the default field we declared in solrconfig.xml. I'll spare you with the response. There are a lot of powerful features in Solr that are not that commonly used. To see this example in Java have a look at the Github repository of this blogpost.